CO2 Laser Marking Systems Proven CO2 RF-excited, sealed-tube laser marking systems provide a galvo-steered beam designed for marking. The CO-Series laser marking systems are excellent for marking substrates like wood, glass, Plexiglas®, quartz, ceramics, fabrics, and other organic materials. Mark-On-The-Fly versions are available for line speeds up to 500 ft/min. (150 meters per minute). Also available are embedded controller versions requiring no separate PC. E-Series diode-pumped YAG and vanadate laser markers offer improved beam quality, increased depth of focus, and higher peak powers compared to fiber lasers - for fine marking, heat-sensitive materials (metal foils, silicon, plastics, etc. ), and applications where higher consistency is required. Embedded controller versions requiring no separate PC are available for most models. F-Series fiber laser markers are ideal for industrial situations, typically marking a range of metals or plastics, where a robust compact marking system is desired. The durable design is perfect for integration into a high-volume production line, and a dual-scanning head version can further boost production throughput. Power Range: 10-30W Q-switched – Higher powers available. Please consult factory for pricing and availability. U-Series UV laser with its 355nm wavelength is versatile in marking a wide range of materials is perfect for "cold marking" applications where heat zones are not allowed - the UV will mark plastics and silicon materials without the need of additives and will also mark glass with drastically reduced risk of microfracture. The excellent beam quality also affords this laser the ability to be utilized in micro marking applications such as electronics, circuit boards and microchips in addition to solar panels and precise medical marking applications. Fully programmable Pinstamp® Single and Multi-Pin Marking Systems are based on Telesis' original, patented "Floating Pin" design. A pneumatically driven and returned metal pin permanently indents the marking surface with either dot matrix or continuous line characters - even logos, graphics or 2-D Codes*. Since the marking pin "floats" on constant return air pressure, surface irregularities up to 1/4" are easily accommodated. And, no stress concentrations occur. BenchMark® dot-peen marking systems, proudly manufactured in the U.S. by Telesis Technologies, enable you to easily achieve quality, permanent part marking virtually anywhere you need it. Whether you have only an occasional need for marking, or if you need a marking capability in various locations, the BenchMark® series is ideal. 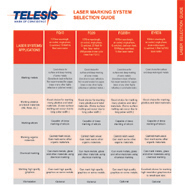 TeleScribe® marking systems from Telesis Technologies are the preferred choice when low-noise marking is required. Sometimes called "drop and drag" or scratch marking, scribe marking is an established standard for VIN marking and other applications where the noise of a standard dot peen marker is a concern.